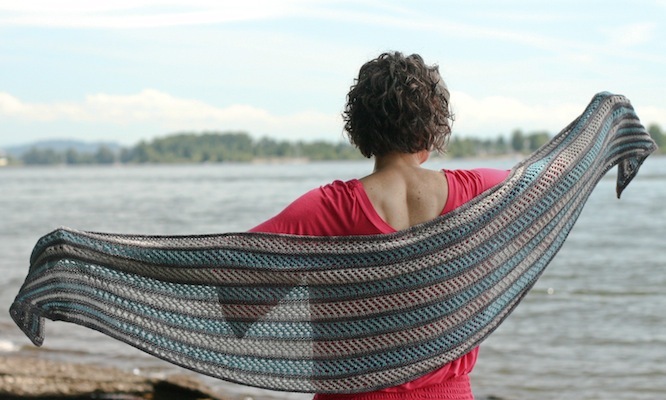 For some time I have had a couple multi-colored shawl ideas floating around. 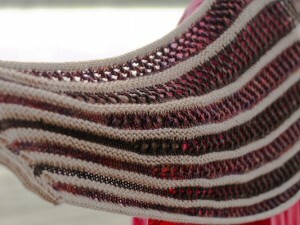 When I saw the Madelinetosh Lovers group on Ravelry had a design category in the ‘MadMay’ events I thought it would be the perfect incentive to work out the design and knit it (twice actually). Stratigraphy got it’s name from the term used by archeologists and geologists to define the study of sedimentary layers. It is one of those patterns that once you know the rhythm of it, you don’t need to keep a copy of the pattern with you. If you like to alter partterns, there are tons of ways you can do that with this design, and I’ve included a list of suggestions in the pattern, or if you are one who likes to keep with the directions, there are two sizes included to choose from. The large (shown in blue) measures 72″ across the top and 30″ deep at the center. The small (in brown) is 60″ across and 24″ deep. 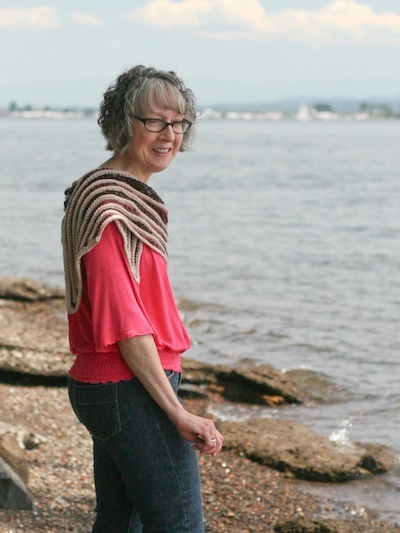 The pattern is worked from the top down, starting with a crochet provisional cast-on then working mesh stripes that incorporate short rows divided by a contrasting welt. For those who have not tried short rows before and might be a little shy toward them, do not worry – these are the simplest form there is. No wrapping or picking up stitches, just stopping partially way thru the row and turning and working back the other direction. When all the stripes are completed, an i-cord bind-off is worked around all edges of the shawl to match the dividing welts.